It’s Vacation Bible School week at our church. I’m helping with snacks, which is a pretty sweet gig – we get to stay in the air conditioned kitchen, for one thing. Anyway, after it was over tonight, I went to the grocery store to pick up a couple of things for tomorrow night. I pulled in to a parking spot, waving enthusiastically to Joyce who was just pulling out. Joyce is a dear woman and grandma of seven who goes to church with us. She waved back, and then paused as she pulled out, and rolled her window down. “Hi!” I burbled, as I headed toward the store. Huh? I stopped and looked – really looked – at my car. 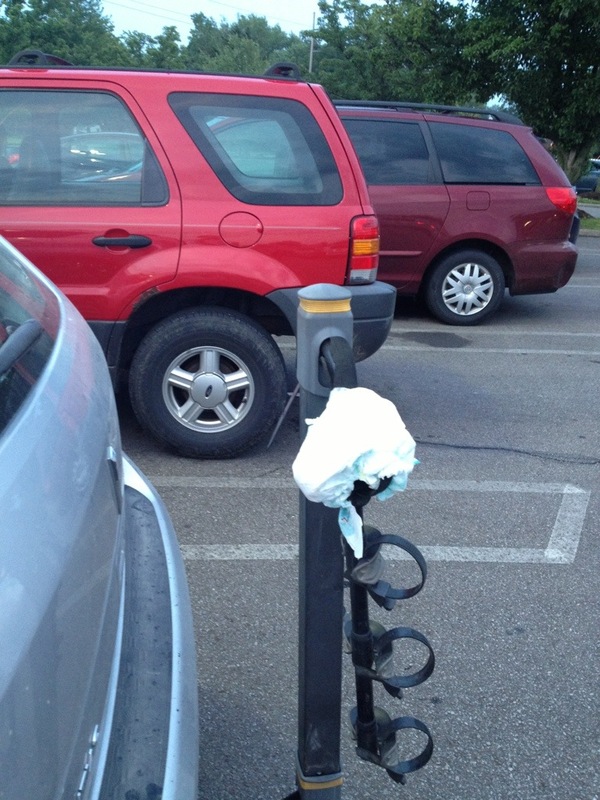 Yes, that’s a diaper there on the bike rack. And as I snatched it up, the unmistakable smell of ammonia wafted up from my hand. A used diaper. It was there while I drove the 10 miles in to church, it was there while my car sat in the parking lot for 2 1/2 hours, and it was there as I drove to the grocery store. Lovely. I know exactly who put it there, and I’ll give you one guess. He lives in the same house I do, and is the only other one tall enough to drape a diaper gently over the bike rack in just that position. I haven’t decided yet how I’m going to make him pay.